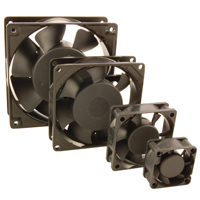 Cooling fans are required to protect critical electronic components by keeping them at an optimal operating temperature, thus protecting against thermal variances that could harm the components and preventing a premature failure, while ensuring optimal performance. These fans utilize a propeller to create a large airflow in the direction of the axis, moving the air in a direction parallel to the axis of the blade. AC fans provide a constant flow, whereas DC fans can run at variable speeds. DC fans consume less power, generate lower levels of EM and RF interference, and are much quieter in operation, making them ideal for personal computer and server applications.